July 27th; novelist and essayist Elizabeth Hardwick is born on this day in 1916 in Lexington, Kentucky. Hardwick attended the University of Kentucky and later Columbia University in New York. New York’s liberal intellectual bent inspired her, and she began contributing perceptive, well-written analytic essays to the Partisan Review. She published her first novel, The Ghostly Lover, in 1945. In 1949, Hardwick married future Pulitzer Prize-winning poet Robert Lowell, with whom she had a daughter in 1962. Despite Lowell’s manic depression, frequent breakdowns, and heavy drinking, Hardwick stayed with him until he left her in 1972 to marry Lady Caroline Blackwood of England. He later returned to Hardwick, with whom he stayed until he died of a heart attack in 1977. In the meantime, Hardwick had published a second novel, The Simple Truth (1955), written an essay collection, and edited a volume of William James’ letters. 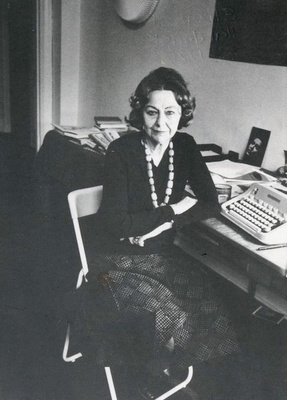 She also helped found the New York Review of Books in 1963, to which she was a frequent contributor. Her 1999 book, Sight-Readings, takes a close look at Katherine Anne Porter, Joan Didion, Edith Wharton, TV evangelists, and many other topics.